The market overall is struggling today, however’ Lions Gate Entertainment seems to bee leading the charge. After releasing a poor earnings report, the stock has started to tank. Today, we’ll talk about what we saw from the earnings report, how the market reacted to the news, and what we can expect to see from LGF moving forward. So, let’s get right to it..
Earnings Per Share – In terms of earnings analysts expected for LGF to produce $0.48 per share for the quarter. Unfortunately, the company came in well below expectations, reporting earnings in the amount of $0.37 per share. Aside from missing expectations, this represents a massive decline in year over year earnings. In the same quarter last year, LGF reported earnings in the amount of $0.65 per share. Revenue – Unfortunately, revenue also came in well below expectations. In terms of revenue, analysts were expecting to see LGF generate $780.6 million. Unfortunately, the company missed these expectations in a big way, producing only $670.5 million in revenue for the quarter. That signifies a 10.8% decline in revenue year over year. As investors, we’ve learned over the years that news moves the market, and there are few pieces of news that have the ability to move the market as much as earnings. When earnings are positive, we can expect to see gains. When earnings are negative, we can expect to see losses. Unfortunately, LGF produced incredibly negative earnings. As a result, the stock is falling in a big way today. Currently (11:16), LGF is trading at $17.97 per share after a loss of $7.48 per share or 29.39% so far today. 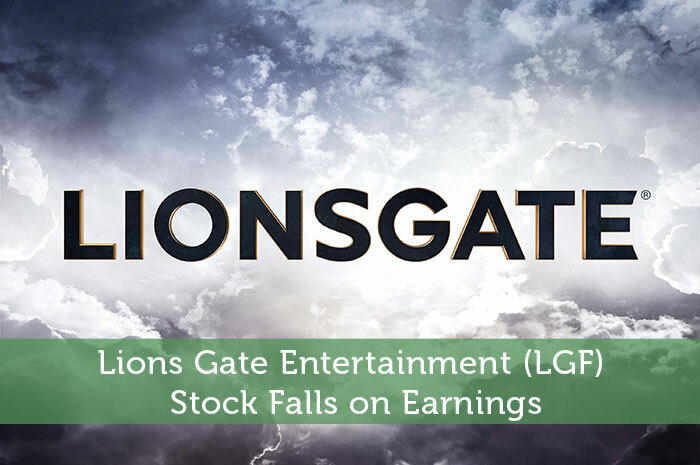 Earnings – Unfortunately, Lions Gate produced an incredibly negative earnings report. As such, we can expect to see declines. Ultimately, investors invest in companies for growth. Poor earnings reports like this tend to have a lasting effect on investors, and drag the value of the stocks associated with these reports down for some time. Economy – It’s also important to consider the industry in which LGF operates. The company is an entertainment company. This is important given current economic conditions. When global economic conditions are positive, consumers tend to spend more money on entertainment. When conditions are negative, consumers look to save money, and one of the best ways to do so is to spend less on entertainment. Unfortunately, economic conditions are becoming a major concern and will likely lead to further bad news for LGF. While I do believe that short term declines are coming, in the long run, I have a relatively bullish opinion. The reality is that Lions Gate has made a name for itself in the entertainment industry. As economic conditions improve, we can expect to see sales improve, leading to investor excitement and long term gains. Where do you think LGF is headed moving forward? Let us know your opinion in the comments below! On short term, sometimes you loose, sometimes you win. On long term with wide portfolio with exposure to one share no more to 5% you will never loose, question is how much you going to win. Beer market is time to buy, but I will wait for my buy till April 2016. I think that will be deepest point.